Brain imaging may help to improve objective measures of football-related injuries. The concern for concussions, especially for repeated concussions in young athletes, is on the rise. According to the National Institutes of Health, sports are the second leading cause of traumatic brain injury among people who are between 15 and 24 years of age—only motor vehicle crashes cause more. According to the US Centers for Disease Control and Prevention, some 248,000 children and teens land in the emergency department each year as the result of a concussion suffered during sports or other physical activities, such as bicycle riding. Among sports, football carries a particularly high risk; despite wearing protective headgear, football players have a 75% chance of sustaining a concussion, according to the Sports Concussion Institute. Not only are the numbers alarming but also "in children and in young adults, there have been cases of second impact syndrome, where a second concussion can result in dramatic and accelerated swelling of the brain, which can lead to death," says Alexander Norbash, MD, a professor and chair of radiology at the University of California, San Diego School of Medicine. "We're not only concerned about the long-term effect of concussions if they're ignored; we're also concerned about the short-term effect of concussions and when we can safely have players return to play." Traditionally, concussions have been diagnosed by symptoms, which can include a headache that gradually worsens, nausea, dizziness, confusion, forgetfulness, insomnia, and irritability. The problem with this method of diagnosis is that players often believe that they have to stay active to be valuable to their team and may not always be totally honest about how they feel, Norbash says. Neurologists and radiologists agree that there needs to be a better way to diagnose concussions and their impact on brain health in both the short and long run. "We really need an objective way to understand when a person's cognition is affected by a concussion and, of greater immediacy, if their life is at risk because of a head injury," Norbash says. To help address this need, imaging may be able to play a significant role. Because of the siting requirements of MRI and the time it takes to complete a scan, imaging may not be a solution to diagnosing concussions on the sidelines of any football field—high school or professional—at least not currently, although two National Football League (NFL) stadiums have MRIs on site. However, a number of research projects are under way across the country that use imaging to better diagnose concussions and their impact on athletes' brain health. A number of studies show that concussed players demonstrate changes in blood flow to their brains as a direct result of concussion and recovery, and imaging is proving to be very good at showing those changes, the researchers say. One study that is being conducted by University of California, Irvine (UCI) researchers at the Toshiba MR Research Center in Irvine, California, is looking for links between cerebral microbleeds and head trauma. Cerebral microbleeds are relatively common in people older than 60, and the risk for microbleeds continues to increase with age, says lead researcher Mark Fisher, MD, a UCI professor of neurology. But cerebral microbleeds should not be present in high school students, he says. Noncontrast MRI is a safe and effective way to examine youth athletes for early signs of cerebral microbleeds, which may be an early sign of chronic traumatic encephalopathy (CTE), which is a well-documented potential result of subconcussive head injury, Fisher says. "As a consequence, we are looking for the presence of cerebral microbleeds in students who are high school football players," Fisher says. "We think that the presence of microbleeds in the high school football population will be a marker for head trauma and could be a biomarker for risk of CTE." The UCI researchers are recruiting 100 high school football players as test subjects and 50 control subjects who do not play football. "We're in the midst of recruiting and relatively early in the study," Fisher says. The study subjects will undergo noncontrast MRIs throughout the season with Toshiba's Vantage Titan 3T MR system, which was chosen for its ability to provide noncontrast neuroimaging. The Titan 3T system has a suite of advanced neuroimaging sequences that are sensitive to blood flow as well as blood products, says Jon Furuyama, PhD, product manager in the MRI business unit at Toshiba America Medical Systems. One of the sequences is Toshiba's Flow-Sensitive Black Blood (FSBB). T2-weighted sequences are particularly sensitive to microscopic susceptibility differences, but when using longer echo times, overall image quality begins to suffer. The FSBB sequence applies motion-probing gradients to generate significantly improved vessel contrast, without suffering from excessive T2 decay. "We're looking for very slowly moving blood which could be a sign of microbleeds," Furuyma says. While slowly moving blood could be an indication that the player has a microbleed, it's too soon to say what the research will show, he adds. Fisher also can't "make any firm statements one way or another" at this point in the research, but he, too, is hoping "to be able to offer guidance regarding the safety of players returning to the field based on our findings." In July, researchers from the Medical College of Wisconsin presented a study at the American Academy of Neurology's Sports Concussion Conference in Chicago that found concussed football players had significant blood flow reduction in the brain after clinical recovery. Their study was a follow-up to one they presented in November 2015 at RSNA. 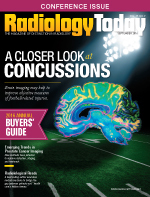 "The main finding of the study we presented at the Sports Concussion Conference was consistent with what we presented at RSNA last year," says Yang Wang, MD, PhD, an associate professor of radiology at the Medical College. The first study examined 18 concussed players and 19 nonconcussed players. All of the players underwent baseline studies before the football season. The players who were concussed underwent an MRI within 24 hours of their injury and had a follow-up MRI eight days later. These players showed significant impairment on clinical assessment at 24 hours after their injury, but they returned to their baseline levels at eight days. While their clinical assessments showed that their concussion symptoms improved, the MRIs of their brains showed that the concussed players had significant decreases in blood flow eight days postinjury. Players who had not been concussed had no change in cerebral blood flow between the two MRIs. "The MRIs showed that even those in clinical recovery still had neurophysiological abnormalities," Wang says. The cohort for the second study was about one-third larger, and the researchers used an advanced arterial spin labeling sequence with multiple postlabeling delay to measure blood flow for this study, Wang says. The second study also involved more MRIs at 24 or 48 hours after the head injury, and at eight, 15, and 45 days out. "This way, we can see the full picture of what's going on after a concussion," Wang says. Wang says he's hoping the studies, which are ongoing, can contribute to the discussion about whether athletes, young athletes in particular, should be concerned about potentially increased susceptibility to long-term effects from a second concussion. Researchers from University of Texas Southwestern Medical Center in Dallas; Wake Forest School of Medicine in Winston-Salem, North Carolina; and Children's National Medical Center in Washington, D.C., have also added to the growing body of literature about the long-term effects of blows to the head from contact sports and their effects on young people's brains. In May, the researchers published a study in the Journal of Neurotrauma that found youths who play a single season of high school football can have brain changes, regardless of whether they are diagnosed with physical symptoms or concussions. The researchers evaluated approximately two dozen players who underwent pre- and postseason tests: cognitive (reaction time, memory, and executive function), MRI, and magnetoencephalography. During the season, the players wore special helmets embedded with sensors that detected impacts the players received. The National Institutes of Health-funded study, in its third of five years, is looking at five consecutive seasons individually. "It's [also] important to conduct longitudinal studies to see if there are changes that persist beyond the end of the season," says Joseph Maldjian, MD, chief of the neuroradiology division and director of the Advanced Neuroscience Imaging Research Lab, which is part of the Peter O'Donnell Brain Institute at UT Southwestern. "That's where we want to go next." One of the MRI techniques that the researchers used is diffusion kurtosis imaging (DKI), which is being used to detect normal development as well as pathological changes in neural tissues. DKI measures water inside the brain cells and allows researchers to measure abnormalities in white matter. White matter is made up of fibers that connect brain cells and can speed or slow nerve signals. Damage to white matter may be what limits the ability of the brain to make proper connections after a traumatic brain injury, Maldjian says. Combining cognitive evaluation, biomechanics, and imaging helps "our understanding of the effects of subconcussive impacts on the brain," he says. Because they use helmets with sensors, the researchers are limited to studying helmeted sports. However, Maldjian says, "we are looking at alternate sensor technologies, such as mouth guard-based sensors, that will allow us to study other sports that don't use helmets, such as girls' soccer." The goal of their work, he says, is not to alarm parents but to "understand what's going on and to try to keep football and other contact sports safe for millions of youth and adolescents, whose brains are still developing. We're hoping that we can look at our results in terms of particular activities or drills … to see if we can help shape the future of some of these sports so they're safer activities." Hunt Batjer, MD, a professor and chairman of neurological surgery at UT Southwestern, an expert on brain injury, and an advisor to the NFL, says researchers might also get more useful information on the effects of concussions using PET imaging to detect tau proteins in the brain. Alzheimer's disease researchers have found that they can use a new agent that binds to tau and makes it visible on PET scans. It is believed that the buildup of two proteins, amyloid beta and tau, causes cognitive impairment in Alzheimer's. "If I were a betting man," Batjer says, "I believe it will be a combination of techniques like this that will help us eventually to definitively identify brain disorders and the effects of trauma on the brain." In addition, UT Southwestern is one of a number of participants in a sports concussion registry in the Dallas-Fort Worth area. The registry, which opened at the end of December, is for anyone over the age of 5. Researchers are hoping the registry, by capturing comprehensive data on sports-related concussion and mild traumatic brain injuries, can help to identify the best ways to standardize care and evaluate different treatments of this population. Researchers also are using ultrasound to examine the long-term effects of concussions in young athletes. A study that used ultrasound to map changes in blood flow in the brain after concussions was presented at the American Academy of Neurology's (AAN) 68th annual meeting in Vancouver, Canada, in April. For their study, the researchers employed an advanced version of transcranial Doppler found in neuro ICUs. The researchers developed a series of algorithms that enabled them to measure very small changes in blood flow when patients had mild injuries or concussions. For the study, a group of 66 high school athletes who played contact sports and had recently been diagnosed with concussions were compared with a control group of 169 high school athletes from contact sports (football, soccer, basketball, hockey, water polo, and lacrosse) and noncontact sports (cheerleading, cross country, cycling, tennis, and track). About 30% of both groups were female. Brain blood flow was measured in the concussed athletes within an average of six days after their injury. The concussed athletes also underwent a general concussion evaluation and had their blood pressure checked. Using traditional ultrasound, changes in cerebral blood flow reactivity could only differentiate between the concussed and control groups 60% of the time, but advanced software improved this overall accuracy to 83%. "Our research suggests that the advanced form of ultrasound may add important information for clinicians," says Robert Hamilton, PhD, a member of the AAN. Hamilton also presented his study at the AAN's Sports Concussion Conference in July. Hamilton says he and his colleagues were very encouraged by their initial results and are going to continue to develop the technology. "There are future applications for what we're doing, although more research is needed."